Is state's attorney Anita Alvarez protecting public safety—or an obstacle to justice? Cook County Board president Toni Preckwinkle (left) says state's attorney Anita Alvarez (right) has a "narrow" and "punitive" approach to justice. Not so long ago politicians were afraid of appearing soft on crime, and in many places they still are. But the landscape is shifting rapidly—to the point that everyone who wants to be Cook County's top prosecutor is promising to keep more people out of jail. That was clear to me when I sat down the other day with Cook County Board president Toni Preckwinkle, who brought along a couple of aides, including her chief of staff, Kim Foxx. Preckwinkle wanted to get the word out that Cook County officials have worked together to reform the jail and criminal justice system, which she often calls "the intersection of racism and poverty." But some have worked more than others, and thousands of people are still going to jail who may not need to be. 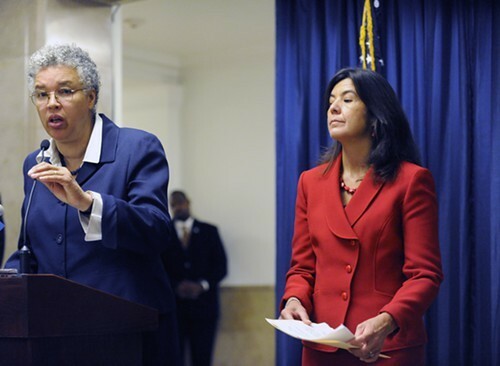 Without much prompting, Preckwinkle said that the county would be better off if voters dumped state's attorney Anita Alvarez next year and elected someone who's not stuck on the tough-on-crime policies of the past—namely, Foxx. "We ought to be trying to figure out why it is that a handful of communities in the city generate so much of our violent crime," Preckwinkle said. "What's our strategy for lifting up those communities? We can't just arrest everybody and think that's going to solve our problems. "So we've got some real challenges, and I don't think the state's attorney's vision is broad enough. It's very narrow and very punitive, in my view. She was one of the people who had to be dragged kicking and screaming through this reform process." Preckwinkle added: "If Kim Foxx decides to run, I will support her wholeheartedly." It seemed appropriate at that point to get Foxx's take, especially since she was sitting a few feet away. Foxx, formerly a prosecutor in the state's attorney's office for 12 years, said she hadn't decided whether to run—and then outlined her case against Alvarez anyway. She said the office has made poor decisions about how to use its resources, prosecuting too many low-level cases that are routinely thrown out and don't help communities battered by violent crime. On top of that, she said, the office hasn't done enough to help people expunge their records after they've served their time. 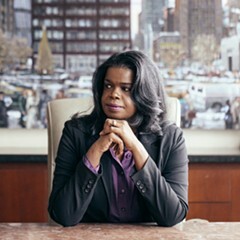 "Justice is doing the right thing at the right moment for the right reasons," Foxx said. "And that's what I think is missing from that office." It's not a compliment to say that the office responsible for seeking justice doesn't know what it is. Sally Daly, a spokeswoman for Alvarez, fired back in an e-mail that Alvarez has been a "trailblazer" in creating programs to steer some low-level offenders to drug and mental health treatment instead of jail. Daly also suggested that Preckwinkle is attempting a power grab. "It is in the public's best interest to elect an independent prosecutor as the Cook County State's Attorney, not a political appointee," Daly wrote. "Under Anita Alvarez's leadership, the State's Attorney's Office will remain independent, innovative and unapologetic about prosecuting those who threaten our safety by committing violent crimes." Violence in Chicago continues to claim lives, putting pressure on political leaders to respond. Yet people here and across the country are questioning the frayed community relations, mass incarceration, and soaring costs that have resulted from decades of crackdown policies. Alvarez won office in 2008 by stressing her two decades as a prosecutor and her sympathy with the victims of crime. But just two years later, Preckwinkle was elected with vows to shake up the county's criminal justice apparatus, starting by reducing the population of the county jail, which had hovered around 10,000 for years. Most jail inmates are African-Americans or Hispanics locked up because they don't have the money to bail out while waiting for their cases to be disposed of. Preckwinkle, Alvarez, Sheriff Tom Dart, and other stakeholders all agreed to try to cut the inmate rolls. Instead, they kept pointing fingers as the jail population went up. It wasn't until the last year—after the Illinois Supreme Court directed the officials to make changes—that it began to drop, in large part because more defendants are now sent home on electronic tethers. Preckwinkle and Alvarez butted heads again last year when the board president called for an end to the automatic transfer of juveniles to adult court when they're charged with certain violent crimes. Alvarez resisted, saying public safety could be at risk. After rounds of negotiations, the General Assembly passed a compromise bill earlier this month that would keep the majority of these cases in juvenile court. It's now on Governor Bruce Rauner's desk. In our conversation, Preckwinkle called the bill a "victory" even though it didn't go as far as she'd like. "My view is that we shouldn't have teenagers in the jail at all," she said. Meanwhile, Alvarez stepped forward with her own reform plan. In April she announced that her office will stop prosecuting many low-level drug possession cases. Many misdemeanor marijuana charges will be dropped, while those caught with small amounts of heroin or cocaine will be offered drug treatment or counseling. It was an abrupt change for someone who had previously pushed forward with more than 20,000 low-level possession cases each year, even though it was well known that judges routinely dismiss them. But Alvarez denied she was trying to look like a reformer on the eve of her reelection bid. "Absolutely not," she said. "I'm ready for whoever wants to take me on." Perhaps, but she knows that her opponents will try to portray her as stuck in the dark ages—which is to say, the 80s and 90s. In addition to Foxx, former prosecutor Donna More, who's announced she's running, and county commissioner John Fritchey, who's been mulling a bid, have both slammed Alvarez for not doing enough to keep nonviolent offenders out of the system. "There's a role for the state's attorney's office to play outside of just waiting for crime to happen," Foxx said. On that point everyone agrees—which is telling in itself.